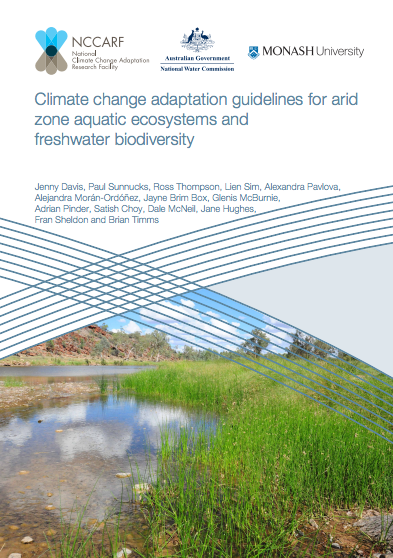 National climate change adaptation guidelines for arid zone aquatic ecosystems and freshwater biodiversity are proposed which emphasize the protection of habitats and processes that support the persistence of freshwater biota under a changing climate. These guidelines are intended to provide guidance for policy development, planning and on-ground actions. The major goal of these guidelines is to reduce the risk of the loss of aquatic habitats, deteriorating water quality and the extinction of aquatic and water-dependent species. A portfolio of adaptation approaches to maintaining aquatic habitats, the water resources that support them, and the species that depend upon them, is proposed within a framework of strategic adaptive management. This approach best addresses the uncertainty that exists as to how climatic changes will play out across the arid zone with respect to water availability and ecological processes. Recommended climate adaptation actions include: implementing a national mapping program that identifies the major types of arid zone aquatic ecosystems and the surface water and groundwater resources that sustain them; recognizing the importance of evolutionary refugia and ecological refuges as priority sites for arid zone climate adaptation planning and policy; protecting a dynamic (spatial and temporal) mosaic of perennial, temporary and ephemeral waterbodies to provide the range of conditions needed support aquatic and water-dependent species with varying life history traits and dispersal abilities; maintaining the integrity of the dry sediments of temporary and ephemeral waters to ensure the persistence of viable seed and egg banks; recognizing the importance of key hydrological and ecological processes, particularly connectivity and dispersal; undertaking vulnerability assessments that determine the climate sensitivity and likely persistence of key habitats; reducing the existing stressors on aquatic ecosystems and aquatic biota; identifying new and novel waterbodies created by arid zone industries (e.g. mining, pastoralism) that could provide valuable offsets for aquatic systems lost through climatic drying; implementing climate adaptation actions within a strategic adaptive management framework accompanied by a dedicated program for indigenous and local community engagement and education.